The Tun Dr Lim Chong Eu Expressway in Penang is finally set to have three lanes on both sides of its entire stretch. A bottleneck near the Batu Uban marine police base which reduces the three lanes (on each side) to two is undergoing a road-widening project that began this month. Penang Chief Minister Lim Guan Eng said the RM3.7mil project was undertaken as a corporate social responsibility initiative by IJM Corporation Berhad. “This expansion and upgrade essentially resolves a 10-year-old problem of a 2km traffic jam caused by the road narrowing from three to two lanes. 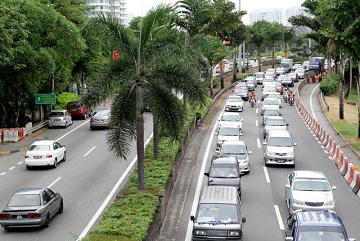 “By widening a 400m stretch on each bound, the state hopes to reduce this traffic congestion problem that has haunted motorists, especially the industrialists and workers at (the Free Industrial Zone in) Bayan Lepas,” he said. He was speaking during a symbolic ground breaking of the project yesterday. Lim added that the project was announced in August last year, but plans at that time included only the widening of one side of the road which was not satisfactory to the state. IJM Land general manager (northern region) Toh Chin Leong said the upgraded project would also include the rebuilding of an overhead pedestrian bridge along the 400m stretch and the building of a U-turn at Persimpangan Bertingkat Gelugor. On the new U-turn, he said a new acceleration/deceleration lane would be built to ensure road users could make the turn safely. “With this U-turn, motorists from George Town who are heading in the direction of Bayan Lepas will no longer need to drive all the way to the Bayan Mutiara Interchange or use the narrow Jalan Hajjah Rehmah in Jelutong. “This will save motorists about 3.5km each way if they are headed to places like Tesco, E-Gate and Green Lane,” he said. Toh said preparation works had already begun on the project and construction would kick into high gear after the Chinese New Year, adding that the whole project was targeted for completion by Sept 1. Free Industrial Zone Penang Companies’ Association (Frepenca) president Horst Rosenmueller, who was also present, lauded the project, saying that it would benefit thousands of people working in Bayan Lepas. “There are many workers travelling daily from the island to the mainland and back so it’s very important to open up this bottleneck. Great news. Sad that it is only address now rather than years ago! There are ample space to make the changes and I wonder why the goverment did nothing for 10 years (as mentioned in this article) until today. Gerakan says "....we have done a lot during our administration, which are not mentioned and highlighted..........". DAP says "....we have done a lot that was not done by the previous administration......". Self praise and bickering goes on and on and on. Well, whatever it is, over this CNY, I do feel that traffic conditions have improved a lot over previous years. What have we done? Maybe the state has successfully tweaked the traffic flow to eliminate bottlenecks (at minimal cost without the need for multi-million ringgit projects by crony companies)? Or maybe Chicken Koh has been quietly orchestrating a traffic optimization program in the background without the people's knowledge? Penang people are simple, eat simple and dress simple. And what we want from the state administration is also very simple...fair, integrity, and don't call us "pendatang". That's heart breaking, OK! IJM pays to benefit THE LIGHT... and LGE gets the LimeLIGHT. We have to admit that under LGE administration things have been better compare to last time. My vote for him. No matter IJM or LGE gets the limelight it benefits either way. It certainly helps to boost The Light prices. I can only agree the traffic condition improve along Bayan Lepas FTZ coastal highway 5 pm to 7pm due to no right turning during working days. On the Penang bridge same old story or even worse in the pass 3 years after widen from two to three lanes. The Sebarang Jaya roundabout is a nightmare since this PKR doing ceramah almost every night where cars park beside the roundabout and the best part during working/school days. During BN time no such thing this nonsense having ceramah during working/school days. To me lets wait for Penang 2nd link bridge to complete and access if the traffic condition is still the same or improve or worse. This is great. But no time line and target completion date may end up as empty talk/ promise.